Over the last 15 years, altimetry satellites have been poring over the oceans in every detail, collecting more data in 10 days than could be gathered over several centuries by ships. This nascent revolution in oceanography promises to improve climate forecasting.
" Altimetry has allowed us to obtain measurements distributed uniformly around the globe, whereas before we could only rely on local readings, " explains Yves Ménard, Jason-2 Principal Investigator at CNES. " Moreover, these measurements are acquired over the same points every 10 days, thus enabling regular temporal and spatial monitoring of ocean phenomena. ", Such data have greatly advanced the science of oceanography. 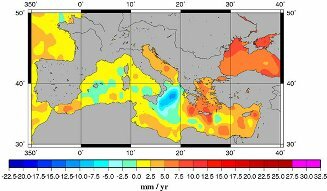 For example, satellite altimetry has confirmed a rise in the mean sea level of 2 to 3 mm per year and revealed big local variations. Chart of the major ocean currents. Credits: AVISO. Another important result concerns the major ocean currents like the Gulf Stream. Thanks to altimetry, their annual and multi-year variations as well as the instabilities they cause are now better understood. For example, many eddies move about the oceans transferring heat to the atmosphere. Wave trains*—like the El Niño and La Niña episodes in the Pacific—driven across the oceans by winds have a crucial impact on climate. These instabilities were previously unknown. " We have discovered that there is a lot of turbulence in the oceans at spatial and temporal scales of days to years, and a few kilometres to thousands of kilometres " says Yves Ménard. New tide components also have been revealed, increasing the accuracy of open-ocean tide models from 10 cm to 2cm. Le niveau moyen de la Méditerranée s’est élevé, conséquence du réchauffement climatique. Crédits : AVISO. Following on from Topex/Poseidon and Jason-1, Jason-2 is set to take over the mission of these pioneering altimetry satellites for the next 5 years. But scientists are already looking further ahead to the challenges and performance requirements facing future missions.
" Although Jason-2 is very precise, it’s spatial resolution is still a bit limitedsays Yves Ménard. The gap between adjacent ground tracks is a few tens of km, which is a problem for observing small-scale phenomena, particularly those close to coastlines. " One solution is to develop wide-swath satellites capable of covering 100 km at a time, which will significantly improve sampling frequency.
" The ultimate objective is to combine altimetry data with other space and ground measurements and sophisticated mathematical models to better describe and predict ocean phenomena at all scales. We will then be able to model their impacts more accurately to improve climate forecasts " concludes Yves Ménard. Jason-2 was “wrapped up” like a present on 1 June. Last week, Jason-2 was weighed and mated to the flight adaptor equipped with a new vibration damping system. 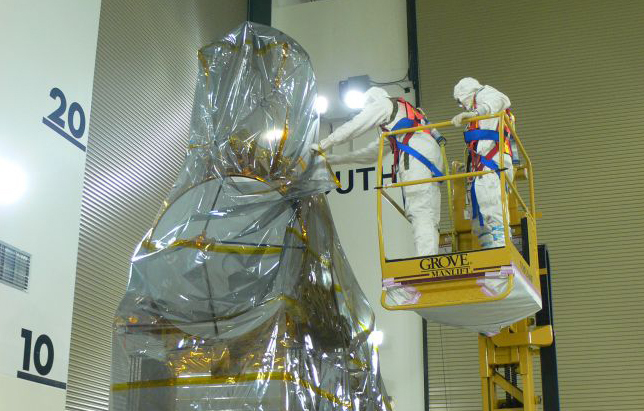 After checking of electrical connections, the satellite was wrapped and stowed in its container ready to be transported to the launch pad. This operation, scheduled Monday 2 June, was delayed until Tuesday 3 June because of high winds exceeding the permissible limits for erecting the satellite at the top of the launch tower. The launch is still planned for 15 June and the trajectory is being finalized.